Gravity Feed Water Kit comes complete with everything you need to attach your Hydrofogger or Minifogger to an overhead water tank or reservoir. This connection is used in areas where access to a water pipe is either not possible or a permanent water connection is not desired. 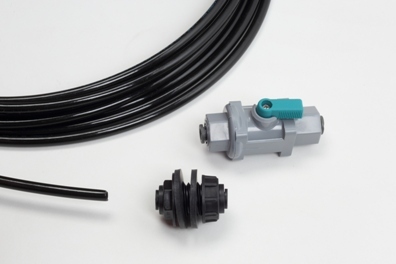 Kit contains a Bulkhead Fitting and 2 Washers which you will drill through your reservoir's wall. Simply then attach the 1/4" tubing to the reservoir, splice in the Shut-Off Valve, and attach the other end of the tubing to your fogger. Fill your reservoir with water and elevate above the fogger. Gravity takes care of the rest! Also included is 25 feet of 1/4" Polyethylene tubing as well as a Shut-Off Valve. Shipping & Handling is free when ordered with a Hydrofogger or a Minifogger.